I will send in a pic and my info, soon as I get a decent pic of the eye!! thats alot harder that it looks to do, fer cryin out loud! Yup, they should invent a kind of reverse camera that takes a picture of the viewfinder! DMXX-here is my 23&me data, along with a picture. -some pics had a dark ring around the outside of the blue, many did not, but I wonder if that is a function of the flash on the camera? Fantastic, thank you AJL and Mike for the new additions. I'll be posting the first inferences on the data pretty soon (stretched very thin at the moment with the R1b write-up, this project and some other personal enterprises); expect something substantial here in the next four days! The response has been pretty impressive so far but I could definitely do with some more samples. The more I receive, the more clarity I'll have concerning the significance of certain SNP's. I'll attempt to get an example of my sister's, nephew's, and one cousin's eyes and then post their SNPs, or are you really alright with just a description? I would be perfectly happy with descriptions, yes. It would be helpful for me if they could be compared against the panel shown below. The color of my eyes lies somewhere in the brown-spectrum. The photo below is from a professional shooting, I zoomed it to 200%. This one I just did in the bathroom with my mobilephone. I don't have any in natural lighting or daylight handy, but they are brown anyway. Last edited by Sangarius; 07-14-2013 at 01:00 AM. Both my actual eye color and my prediction seem pretty close to those of Sangarius. We're different on a few SNPs, though in (I think) all cases but one we could have at least half matching. Last edited by geebee; 07-15-2013 at 12:17 AM. Would it be possible to have the genotypes for yourself and your brother from the new SNP panel on the original post? I'm using a (much more) updated one this time round. I do still have both the images as well. Please inspect the SNP panel below. No problem. My genotypes are below. I will post my brother's genotypes later. I might be being paranoid but be aware that iris identification is used to prove identity etc. I wouldnt want to post my eyes onto the internet without looking into this. My brother's genotypes are in red. SNPs where my brother and I differ are in bold. There are four. 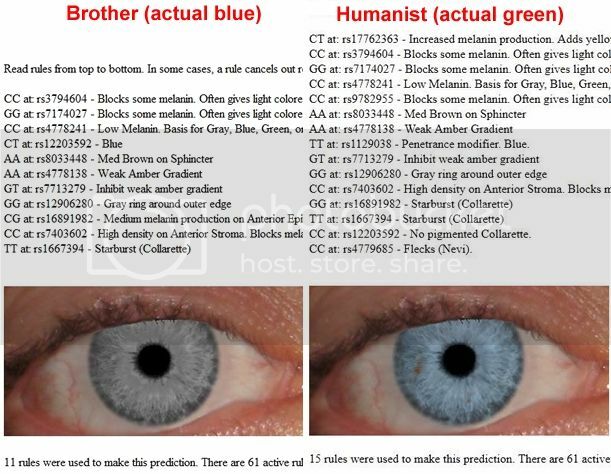 For those who do not recall, my brother has blue eyes, and I have ~green eyes. Last edited by Humanist; 07-14-2013 at 06:08 PM.